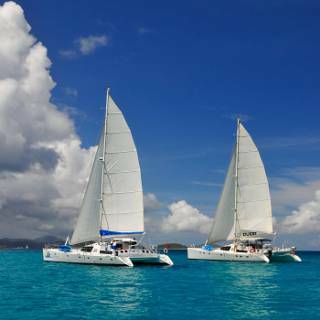 Classic Catamarans sets itself apart by improving EVERY aspect of your catamaran vacation experience (safety & comfort, fun, dining & more) with our experience. Now let more of our customers tell you in their own words about their catamaran vacation, then please continue by reading about us, the Owners & Crew of Classic Catamarans. When we look back upon this week the smiles we wont contain. For in this short span of time our hearts will remain. We look forward with a faithful heart that our paths will cross again. But if our fate takes a different path, please know you are a friend. The Caribbean waters changing colors atop of every wave we roll. And the sweet Danish accent of our captain and his kin. But none of these will we cherish as much as the people we’ve come to know! Thank you both for the most incredible vacation we’ve ever had. This is my third BVI charter on a catamaran. It is so far above the rest that words fail me (some thing all my fellow charterers and crew will tell you is near impossible). 4 guys – needing an escape – from the hustle of the real world have come together for a spectacular trip, beautiful scenery, excellent comfort, superb cooking and meals, a plethora of available activities, and a tour of great bays, great cays, and great bars. We can honestly say that this has been our best vacation ever. Relaxation, great food and drinks, beautiful sights and the best company ever. Thanks for putting up with our music and multiple mishaps with your glasses! We will be back for sure! This was probably the best vacation I’ve ever had, and we owe so much of it to you guys. You gave us everything we could have possibly needed. I know we can be a difficult group sometimes and you were so patient with us! Thank you for everything! I will never forget this trip or you guys! My life is full of so many blessings – three fabulous, kind, caring children, a terrific husband, many wonderful friends and a loving family. My blessings grew this past week with the beautiful turquoise water, warm white sand, swimming, snorkeling, walks, quite time reading books and lots of family time. My blessings (my family’s blessings) also grew meeting you! Life on Breanker was coming HOME! Not only were we fed (most deliciously) and sheltered (rocked to sleep every night) but we felt at peace and loved. We are so very thankful to you both for having us in your home (Breanker)! We will forever hold your beautiful hospitality and most especially your friendship within our hearts! Parting is such sweet sorrow…..
Love, Michelle and the whole clan. Thank you for this once in a lifetime experience. This has been so much fun to be part of your life on the water. I know we were a hard family to put up with and I thank you for your patience. Again thank you so much for everything. 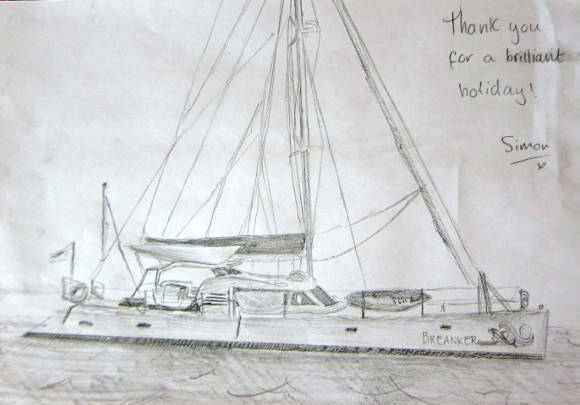 Where do we start to thank you for the most wonderful week in your floating home. From the minute we met Kristian in Tortola we all knew we were going to have a special week. You have both exceeded our expectations by so very much. We feel that we have known you far longer than a week. You have anticipated and catered to out every need before we even thought of it! The meals have been fantastic – one better than the one before. Kristian has taken us to the most beautiful places to snorkel and in and out of all the different bays. Thank you so very much for your wonderful hospitality and your gentle kind care of us this week. It has been so wonderful to be with our family and dear friends for a week on your beautiful boat. It is not so often that we get the change to be so close to our girls for a week. We feel like we made two new friends that we will think of often. We WILL be back again!! Please call us anytime you are coming to the States. We would love to reciprocate your hospitality. This trip was absolutely wonderful! You guys did so much for us this past week and I hope you know how grateful we all are! You made this trip very memorable and made everything run so smoothly! Thank you so much for making this week an amazing experience. I came into this vacation very stressed and over worked. I needed something to take everything off my mind and this just did it for me. The combination of the Breanker and you two are probably the three biggest stress relievers even with the rest of my family onboard. This vacation I will always remember. Thank you very much! This has been a wonderful experience for our family. We had a goal of bringing this family together and having a meaningful commitment ceremony. All was achieved but at a level that far exceeded our expectations. You two were a big part of making that happen. We will always remember this special trip and its moment in time makes a milestone for us. Thanks for your hospitality, patience and taking a firmer hand with the kids – it turned our vacation around! 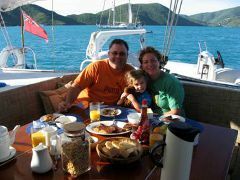 Our last evening on board Breanker after sailing the BVI. We hoped that it would never end! You both made our vacation memorable. This was our first trip to the British Virgin Islands, and it was a week that we will never forget. You made us feel welcome, took us on a sailing adventure of many islands, served a wide variety of gourmet food from your kitchen, showed us were the best snorkeling was and provided us with all the comfort and service that we could have imagined. On a scale from 1 to 10, you rank as an 11. This was one of the most relaxing vacations we have ever taken – we can’t thank you enough! We envy your life style and wish you the best sailing in to the future. Hope to see you again.